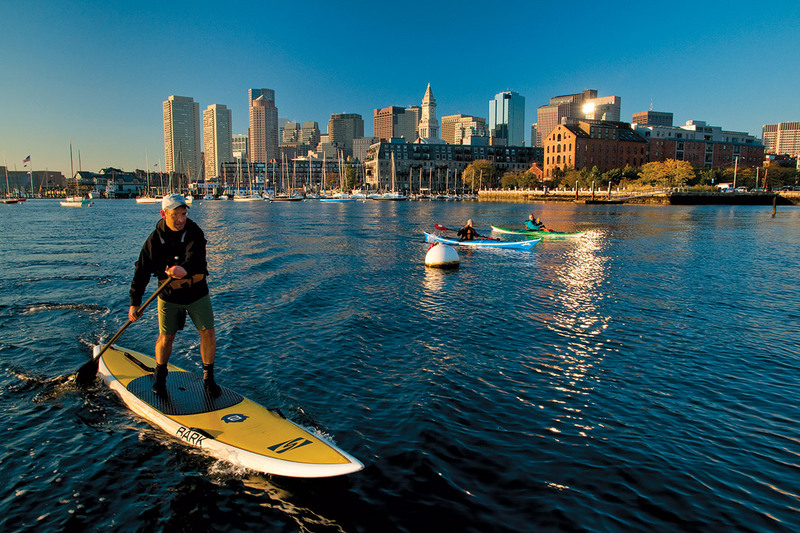 Revel in the best view of Boston’s skyline — from a stand-up paddleboard on the Charles River! Our Skyline Paddleboard Tours begin and end at our T-accessible Kendall Square location. This tour, designed for paddleboarders with some experience, will begin with a quick refresher on SUP strokes, then we’ll hit the water. We’ll paddle underneath the Longfellow Bridge for great skyline views and cross the river into the Esplanade. Upon reaching the end of the lagoons, depending on the weather, the group will either cross back towards Cambridge or use the protection of the lagoon system to make it back to the docks. No matter our course, you’ll get great views of the Boston and Cambridge skylines, MIT, and the Museum of Science. Along the way your guide will entertain you with tales of Boston and Cambridge, talk about the history of the area, and give out some great pointers to make you a better paddleboarder. This trip is best suited for paddlers who have taken our Introduction to SUP class, or have equivalent paddling experience. You should be able to comfortably paddle 3 miles an outing. Two-Hour Boston Skyline Paddleboard Tour meets at our meet at our T-accessible Cambridge location. $49 for an Adult age 16 and up, including two hours of guiding and board rental.